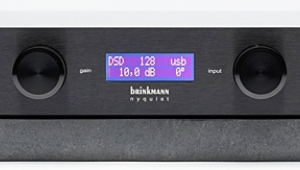 Now that we've entered a world of post-disc audio (sorry, AnalogPlanet.com), audiophile streaming and file-playback products have appeared by the hundreds, and many companies are on their second, third, or even fourth-generation models. The Chinese company Auralic Limited has been pushing bits around for seven years, releasing a half-dozen streaming and network devices. 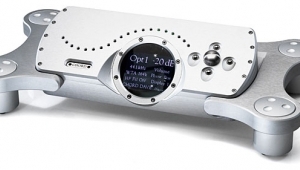 Their newest, the Altair, combines in a single package the functions of a DAC, streamer, and headphone amplifier with volume control, allowing it also to operate as an all-digital-system preamplifier. Just add power amp and speakers. 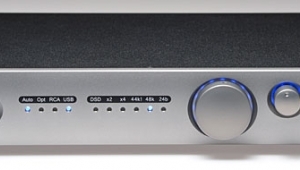 Auralic also makes standalone streamers, DACs, and headphone amps, but adding those separate boxes would result in spending several times the Altair's relatively modest price of $1899. The company claims that the separate boxes do offer more, and that the Altair is not simply a mashup of their Aries wireless streaming bridge and Vega DAC. But I was curious to see what might have trickled down from those pricier separates while offering this much capability for a relative modest outlay of cash. The heart of the Altair is a computer: a proprietary hardware platform, called Tesla and developed by Auralic for their Aries streamers, sitting on a removable board that includes a quad-core ARM Cortex-A9 processor running at 1GHz, 1GB of DDR3 onboard memory, and 4GB of system storage. 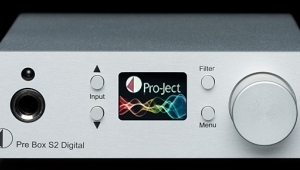 Auralic claims that this hardware will make it possible for the Altair to be upgraded for such planned features as DSD upsampling, and room-optimization software (footnote 1). Also inside the Altair is its dual-frequency Femto Master Clock, which drives an ESS Sabre DAC chip. Auralic says that the dual-frequency approach lets them optimize the clock to sampling rates at multiples of both 44.1 and 48kHz. 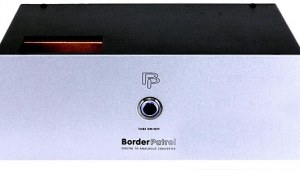 You can also add an optional 2.5" hard-disk drive (HDD) or solid-state drive (SSD) for internal storage of music (the review sample lacked this), and everything is driven by Auralic's Purer-Power linear power supply, which begins with an AC-purification section ahead of the custom-specification toroidal transformer, the latter no doubt contributing much of the Altair's 7 lbs and hefty feel. 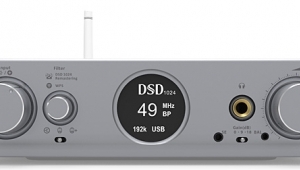 Auralic's Lightning firmware is also included, which supports DXD and quad-rate DSD playback over a WiFi network. (The Altair includes an Intel dual-band wireless card.) The review sample's version of Lightning, v.4, was the latest, and supports multi-room use, resampling, and Memory Playback. 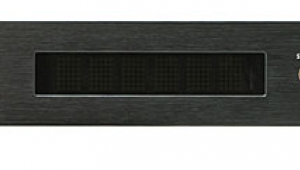 That last feature allows the Altair to cache onboard an entire audio track for local playback without the need for continuous transfers of data via the network, which Auralic says can degrade audio quality. 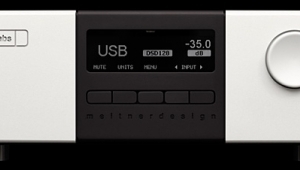 Auralic boasts that the Altair can handle up to 15 digital input sources, some wired, some wireless. On the rear panel, starting at the left, are the balanced (XLR) and unbalanced (RCA) output jacks, each individually buffered and all active all the time, which means that they could be used for a second preamp/amplifier or subwoofer. 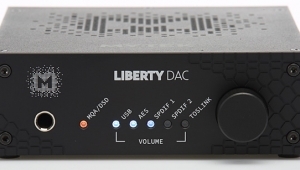 Next to those are the digital inputs (AES, coax, TosLink, USB 2.0) and outputs: USB DAC (for bypassing the Altair's internal DAC), HDD (for connecting an external USB hard drive), and LAN (for wired Ethernet operation and connecting a DLNA/UPnP music server or NAS). At the right are the main power switch, fuse bay, and AC socket. At the top and right of the inputs and outputs are two small jacks for the antennas (included) needed for wireless operation. 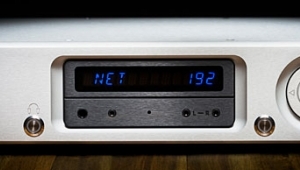 The first time you plug in the Altair and flip its rear-panel power switch, the Auralic logo at the left of the wide front-panel display dimly glows, indicating standby. Pressing the large round knob on the rightthe only control on the front panel, which is also a stepped volume controlbrings the Altair to life, and the display indicates which input is active. If not streaming, it shows the source's sample rate; when the Stream input is selected, the sampling rate goes away and you see the track play and sequence status from your source. At the right, the volume level is indicated in large characters, from "00" to "100." 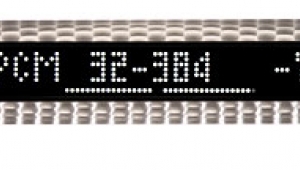 I really like this displayit doesn't blast a dark room with light, but it's easily read from a distance. Operation is simple and direct. pressing the volume control brings up the main menu's six choices: Input, Balance, Phase, Filter, System, Quit. If you select nothing within the first few seconds, the menu times out. 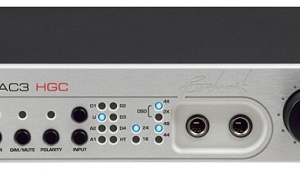 Selecting Input offers choices of AES, Coax, Stream, TosLink, and USB HS. Choosing System brings up submenus that let you program an overall volume setting, as well as where you left the volume for each input. There are also options for remote control, display, some network settings, and Reset. The choices offered in the Balance and Phase menus should be obvious; I'll get to the Filter settings in a bit. All of this is wrapped up in a beautiful and tidy case about the size of a breakfast-cereal box, with a thick aluminum faceplate and a wraparound housing of brushed sheet metal, available in either all silver or all black. After several weeks of operation, the Altair remained just moderately warm to the touch. 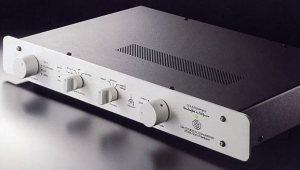 I first ran the Altair in my main system and strictly as a DAC, which required no setup other than plugging it in and connecting source cables. With the Altair connected to both my Meridian Sooloos Control 15 via coax and my laptop running Roon via USB, playing tracks from either was easy, and everything ran as expected. Using Roon on my computer and connected via USB permitted playback of both PCM and DSD files, the Altair correctly switching all sampling rates on the fly. Using the Altair as a streamer was not so simple, at least at first. The first thing to do is to download from the Apple Store Auralic's Lightning DS app and set it up on your iPad (2 or later) and/or iPhone (4S or later). Sorry, no Android or computer versions yet, though Auralic promises they're on the way. The company says that Altair's streaming option is also compatible with OpenHome/UPnP control softwares such as BubbleDS Next and Roon, which can run on Android. However, you'll still need the iOS app to set up the Altair with your network, change settings, and perform updates. After starting up the app, you choose your language, then set up the Lightning Devicein this case, the Altair. The menu leads you through choosing the correct product (the app can also be used to set up any model in Auralic's Aries line), plugging it in, and powering it up. Next, you use the Altair's own WiFi hotspot to connect your iPad directly to the Altair and continue setting up your network. My iPad found the Altair's hotspot. The only hitch was waiting for the Altair to connect to my local open wireless network: the app locked in to a continuous Scanning process, and choosing my network from the list did nothing. The Altair was 10' away from the latest Apple Airport Extreme, but no luckand though my network was clearly there in the list at full signal strength (along with a couple from the neighbors), I couldn't choose it. Nor did restarting the entire process. So, before closing the app, I abandoned wireless operation and tried connecting the Altair to the router via Ethernet. But plugging the Ethernet cable into the Altair confused the appat this point, I couldn't use the app to set up the wired connection. I unplugged the Ethernet cable and the Altair's AC cord, waited a few seconds, and started over from scratch. At the appropriate place in the process I was directed to plug in the Ethernet cable, which I did. This seemed to work, though it required me to set up an Auralic account and provide an e-mail address, gender, and physical location. That done, I activated the device and checked for updates. I received a confirmation e-mail at the successful completion of each step, and crossed my fingers as I set up a library. It found my various servers but would not connect to them, even after I'd entered my user names and passwords. Reluctantly, I abandoned the process and selected Setup Later. This dumped me into the Playback screen, where I could also try to set up a library. The online manuals weren't too helpful, but I was able to directly connect a USB drive to the Altair and, eventually, my DLNA/UPnP servers via the network. Finally, I was in business. I'm guessing there are Altair users who have had instant success with setup, but I wasn't one of themeven though I've successfully set up a dozen or so streamers on this same network. Getting Roon up and running was a bit easier: First, enable the Altair in Roon, then run the Altair as a Roon endpoint. Now I was able to use Roon's most excellent interface on any device, and access all of my networked musicno problem. So after a couple of frustrating hours of trying to set up the Altair, first wireless and then wired, I humbly submit that the easiest way to go would have been to use it as a Roon endpoint. But if you don't want Roon running on additional hardware somewhere else, your simplest option, once everything is running, is either to order the Altair with the optional internal drive, or plug a USB drive directly into the Altair's rear panel and have the Auralic scan your library from the iPad app. After that, the next best thing would be to have the Altair locate a NAS on your network. You can then use Auralic's Lightning DS app interface to select and run your songs and playlists. One nice if impractical feature of the Auralic was that I could use my iPad to use Roon and the Lightning DS app to control the Altair, simultaneously running different music libraries, the preference given to whichever app was last used. As I switched between Roon and Lightning, the track playing would quickly fade, then be replaced by the next track in the queue of whichever app was now up. Then I added in my desktop version of Roon, and now all three were controlling the Altair flawlessly. At this point I had plenty of options active: the Altair running Roon via the network, which is set up on my main laptop using its music library; a USB drive with several thousand tracks connected directly to the Altair's rear USB HDD jack; my NAS, with thousands more tracks, accessed via the network; my Sooloos Control 15 connected to the Altair's coax S/PDIF jack, making accessible another 14,000 albums; and, finally, my other laptop, running Roon directly via the Altair's USB input. Since the app can't do it, the easiest way to switch among all the inputs is with the Altair's supplied remote control. The only odd thing about this handsetclearly an off-the-shelf plastic model adapted for the Altairis that one of the important input labels doesn't match anything on the Altair itself: Stream on the Altair is iPod on the remote. The remote has extra buttons for HDMI, TV, Tuner, and Phono, which obviously don't do anything. Instead of these, it would have been nice to have buttons for directly selecting the Altair's filters, as are found on the remotes of some other products. The Altair's filters can be accessed by using the remote's Menu and navigation buttons, or directly from the appbut, alas, the app can be used to change settings only when the Altair is in Stream mode. Footnote 1: When this review was originally published, we had included MQA decoding as a possible development. This was incorrect and was based on a misunderstanding.Ed. 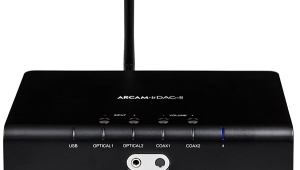 US distributor: Auralic North America Inc. I have an Aries Mini, and had the same kind of connect/disconnect, can't find a network/here's the network, scan/forget issues. I have a Windows based music server that serves all the devices in my home and studio. Some are computers that use the server as a network library, others are just UPnP endpoints. All run with JRiver. But I could never get the Mini to successfully work with the remote library. Many hours of trying, entering path, ID and passwords. Lots of back and forth with tech support. I'd get a lock on the remote library, the Mini would scan everything, and I'd think I solved things, then the next day it couldn't find the library. Start over. Sometimes it'd fail mid-scan several times, then scan fine. Then lose touch with the library again. Tech support said, Windows is a terrible server, just put music on a USB hard disk and connect it. Feeling rather grumpy, that's what I did, for awhile. Then I thought, you know, I'll just drop Lightning DS and use it as a passive endpoint. When I went to do that, I noticed I could select a remote DLNA library. And... magic. Connected to the remote server, scanned the library. Hasn't lost it in weeks. I may still change it to a passive endpoint because then I'll only have one UI (JRemote) but my conclusion is that the UPnP implementation isn't great. The DLNA is. Love the sound on the Mini (with the external power supply.) Punches well above its weight, more than good enough for when I'm working. I was thinking about an Altair for another part of the house where an old Logitech Touch has started showing its age, now that I've got the Mini working well via DLNA. "sitting on a removable board that includes a quad-core ARM Cortex-A9 processor running at 1GHz, 1GB of DDR3 onboard memory, and 4GB of system storage. 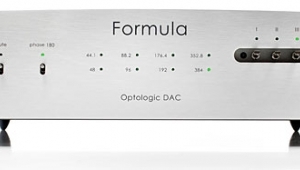 Auralic claims that this hardware will make it possible for the Altair to be upgraded for such planned features as DSD upsampling, MQA, and room-optimization software." MQA-Core like the Blusound Node 2, sure. But this kind of CPU processing is very weak and I doubt it's capable of high quality DSD upsampling or room-optimization at a high quality. I wish companies would stop making claims like this until they can actually show the ability to do it. And I think reviewers should really think about what companies say and realistically consider if there's any truth before just repeating them. Please show a little more skepticism for the unlikely to reduce the chance that your readers end up disappointed. This is why I begin such information with "Auralic claims that . . ." since this is not something I can test. However I get your point: why include it if the reviewer cannot verify the claim. I chuckled when I read your article as I had the exact same issues when setting up my Aries LE. You can not even talk to anyone at Auralic for help. You must email them and wait for days for a response. I've never had a problem solved by the Auralic team. I finally gave up on the Lighting software....thank goodness for Roon. 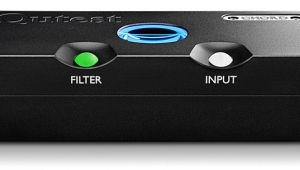 Many devices offer something like a "home theater bypass" output to use when connected to an external device with its own volume control. I feel like this is something of an oversight. I just purchased an Auralic Altair and have found, what I believe to be, a glaring oversight. It doesn't have a volume control bypass mode. . . I feel like this is something of an oversight. As Altair recommended, if you leave the volume set to its maximum, it will effectively be out of circuit and there won't be any degradation of the signal.